Loafers are a truly iconic and versatile style of slip on shoes that have seriously stood the test of time. Buying a new pair of Loafers is almost like a rite of passage, every fall. You can, of course, wear them during the summer months, especially if you have a lightweight Moccasin or canvas constructed Loafer. However, there’s nothing that says, “back to school or college,” better than a shiny new pair of leather Loafers! Even if you are way past your education years, a new pair of Loafers is an excellent back to work staple. New shoes each season instantly update your essential autumn wardrobe. It’s no surprise that the Loafer always makes it onto the Fall Fashion Edit. All the top fashion magazine editors love a Loafer. It is such a wearable and ultimately easy to style piece of footwear. Just in case you are lacking inspiration and not sure whether the Loafer look is right for you though, let’s take a look at how to style loafers the fashion savvy way. Before we take you through some top styling tips, here’s a fun little fact about the Penny Loafer and how it got that name. Back in the 1900’s when Loafers were a favorite for school shoes, moms needed an ingenious way for their kids to store some loose change for that emergency phone call home. The call home, you got it, was only a penny to make! The answer was in the sole of your Loafer, and from then on, this fashionable and very classically stylish shoe was referred to as the Penny Loafer. There are, of course, all kinds of derivatives and variations of the Loafer today, but this classic leather slip-on shoe continues to be super versatile, stylish, and perennially in vogue. We think that the Loafer looks just fabulous styled in a slightly androgynous and masculine inspired way with a sharply tailored suit and a crisp white shirt. It’s a very solid, stylish, and professional look which is perfect for the boardroom. If you are a busy executive and want to look serious yet fashionable and also be comfortable, then a shiny pointed toe Loafer is an excellent alternative to the stiletto. Pair your new leather kicks with a smart straight legged black pair of pants or a navy pencil skirt, and you will look very professional indeed. You could also team your Loafers up with some nicely tailored shorts and a statement blouse or shirt to create a quirky take on this business inspired look. With a nod to your college days, the Loafer can be worn to channel your inner Tomboy while still looking fashionable and girlie. Think Ralph Lauren and the Country Club All American look. They look great styled with a preppy skirt and cardigan combo. For a change to the regular court shoe or a stiletto, a Loafer, especially one with some hardware detailing like a gold buckle or tassel feature, can look simply adorable with a sophisticated LBD. It creates a very hip and stylish look and brings fresh modernity to this kind of outfit. We don’t always feel like wearing towering heels, but not everyone can get to grips with the fact that flats do still offer a stylish alternative and can look gorgeous with a simple black dress. The same applies to a stylish and classically tailored winter jacket. There is nothing more elegant and refined than a woman in a well-polished pair of flats styled with the contemporary and classic appeal of a cashmere camel coat. A chic knee-length fall coat worn with a pair of classic Penny Loafers will instantly take your look to the next level. The Back to School Styled Look. We’ve already mentioned that Loafers are a great back to school look and are fabulous for anyone who might have to wear a uniform for their job. If you spend hours on your feet every day in a standing rather than seated position, then a flat shoe is undoubtedly going to be far more comfortable and practical, but that doesn’t mean it can’t look stylish, too. We think that Loafers look spot on when worn with many work uniforms. You could also try styling your Loafers with a simple and elegant shirt dress and a blazer to again, channel those back to school vibes. You should definitely be getting the picture now that Loafers quite simply go with just about anything and can be worn to pull together a multitude of different styles and looks, no matter what your individual taste in fashion might be. One of the chicest and easiest ways to wear Loafers is with a pair of skinny dark denim or even ripped jeans. Worn with dark denim and a Navy Blue Blazer they deliver an exquisite look, but if you go for ripped denim and a leather jacket with a simple white t-shirt, you’ll achieve a much edgier and more rock and roll inspired look. It’s no surprise that this is one of the go-to looks of many professional models. It’s so easy to pull off and perfectly combines sophistication with a dash of city cool and plenty of comfort for those many hours spent dashing around the city to their next casting session. So channel your own inner supermodel and pair your own pair of Loafers with your choice of denim to achieve that simple street style look that is so popular and easy to pull off. Loafers are very much here to stay. They’ve already been around for over 100 years and show no signs of waning in popularity, so it’s pretty safe to say that they’ll be around for 100 more. You really can’t go wrong no matter how you choose to style them. Just use your imagination and go with what feels right for you. 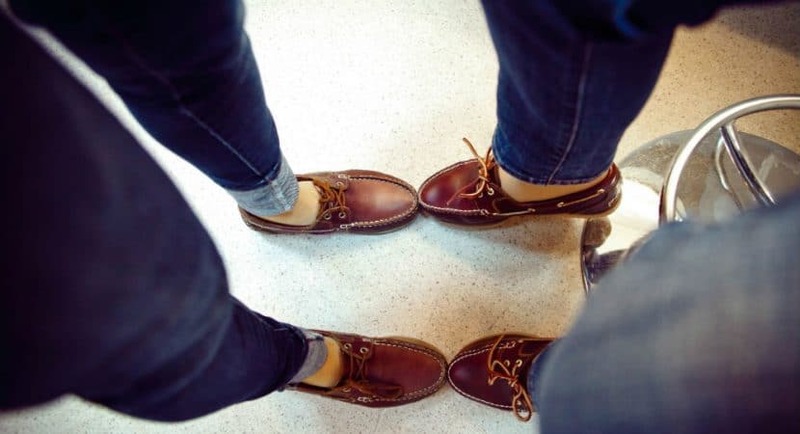 Whether you want to create a classic and elegant look, an off-duty street style vibe, or channel that back to school preppy look, your Loafers will go great with just about anything. Be confident and cool, and put your best Loafer-clad foot forward.